Professor Program Correctness at the Leiden Institute of Advanced Computer Science. As a logician I have worked on the development and formal justification of programming logics. In my thesis (1991) reasoning about dynamically evolving process structures (A proof theory of the parallel object-oriented language POOL) I developed a first sound and complete proof method for a (parallel) object-oriented language, designed and implemented at Philips Research Laboratories. Further development has resulted in a comprehensive proof-theory of a variety of object-oriented features and mechanisms like object creation, aliasing, method calls, multi-threading, inheritance and subtyping. My other publications can be found at DBLP Bibliography Server and my Google Scholar profile. For my research on programming languages for multi-agent systems I also refer to my publications stored by the Intelligent Systems group at the department of Information and Computing Sciences of Utrecht University). Here you can find some selected publications. 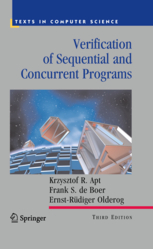 Compositional Verification of Parallel Programs by M. van Hulst (Utrecht University, June 21, 1995). Semantics of Agent Communication Languages, by R. van Eijk (Utrecht University, October 18, 2000). The Agent Programming Language 3APL by K. Hindriks (Utrecht University, 2000). 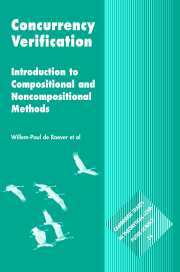 Semantical Analysis of Compositional Proof Rules for Concurrency by U. Hannemann (UU, October 30, 2000). Agent Interaction: Abstract Approaches to Modelling, Programming and Verifying Multi-Agent Systems by W. de Vries (Utrecht University, November 11, 2002). An Assertional Proof System for Multithreaded Java - Theory and Tool-Support by E. Abraham (LIACS, Januari 20, 2004). Verifying OCL Specifications of UML Models: Tool Support and Compositionality by M. Kyas (LIACS, April 4, 2006). Validation Techniques for Object-Oriented Proof Outlines by C. Pierik (Utrecht University, May, 2006). Cognitive Agent Programming: A Semantic Approach by B. van Riemsdijk (Utrecht Uuniversity, 2006). Mobile Channels for Exogenous Coordination of Distributed Systems : Semantics, Implementation and Composition by J. Scholten (LIACS, Januari 10, 2007). Domain Specific Modeling and Analysis by J. Jacob (LIACS, November 13, 2008). Testing Object Interaction by Andreas Gruener (LIACS, December 15, 2010). Time At your Service: Schedulability Analysis of Real-Time and Distributed Services by Mohammad Mahdi Jaghoori (LIACS, December 20, 2010). An Executable Theory of Multi-Agent Systems Refinement by Lacramioara Astefanoaei (Utrecht University, Januari 19, 2011). Organizing Agent Organizations: Syntax and Semantics of an Organization-Oriented Programming Language by N. Tinnemeier (Utrecht University, February 7, 2011). Modelling and Analysis of Real-Time Coordination Patterns by S. Kemper (LIACS, December 20, 2011). Static Analysis of Unbounded Structures in Object-Oriented Programs by I. Grabe (LIACS, December 19, 2012). Combining monitoring with run-time assertion checking by Stijn de Gouw (LIACS, December 18, 2013). Abstract delta modeling : software product lines and beyond by Michiel Helvensteijn (LIACS, December 11, 2014). Enhanced Coinduction by Jurriaan Rot (LIACS, October 15, 2015). Actors at Work by Behrooz Nobakht (LIACS, December 15, 2016). Abstract Behavioral Specification: unifying modeling and programming by Nikolaos Bezirgiannis (LIACS, April 17, 2018). Currently, I am giving (at LIACS) a course on Programmeren & Correctheid. And, finally, here you may find out more about my professional me.